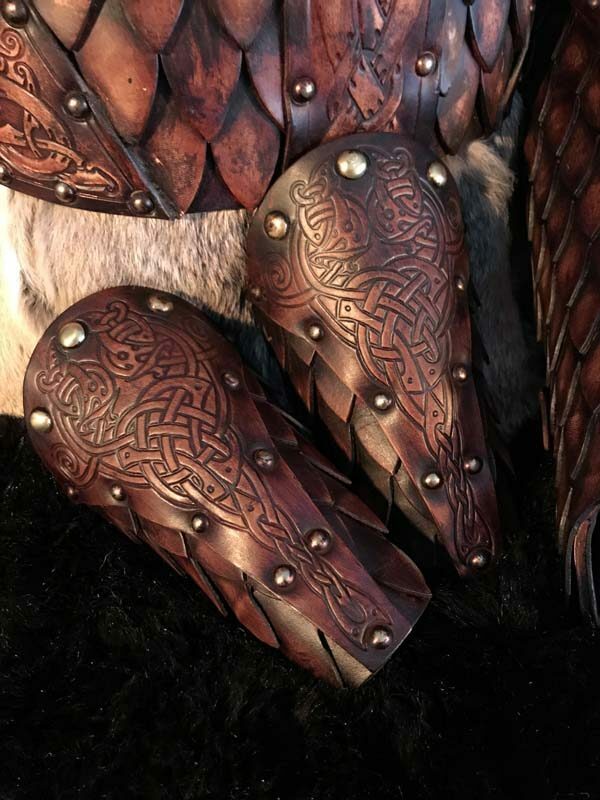 Introducing the NEW Sigrun Armour Full Set, designed by Alex Agricola the founder of Black Raven Armoury, with original Norse Art by our very own Vitor Gonzalez in either Dragon or Wolf designs and built by one of our expert armour smiths. This design really has come as a result of years of feedback? So often woman?s armour being described impractical by the combatants out there or too ?bra like? by people in general, not to mention the countless comments on ?never the right size or shape? 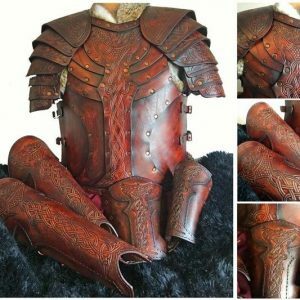 and so was born in my head, the possibility of such an armour?. So here she is? winning the battle of so many boxes to tick? 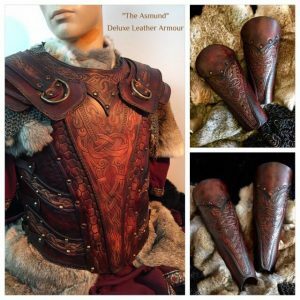 The Sigrun, an armour that could combine beauty, presence? Something that would work whether wielding a sword?. or ruling a kingdom..A combination of formed breast sections that create a practical shape suitable for combat comfort, over 100 individual scales front and rear, for mid section movement and all made using overlapping 3.2mm veg, backed with suede ? Feminine shape, with offering protection AND fully adjustable at the sides, front & rear shoulders not to mention size options that will work from a 36? bust up to a 54? bust, C cup up to an F cup. Although we list up to a 46″ Bust, as in stock, we can produce up to a 54″ Bust, please contact us if you need these sizes. 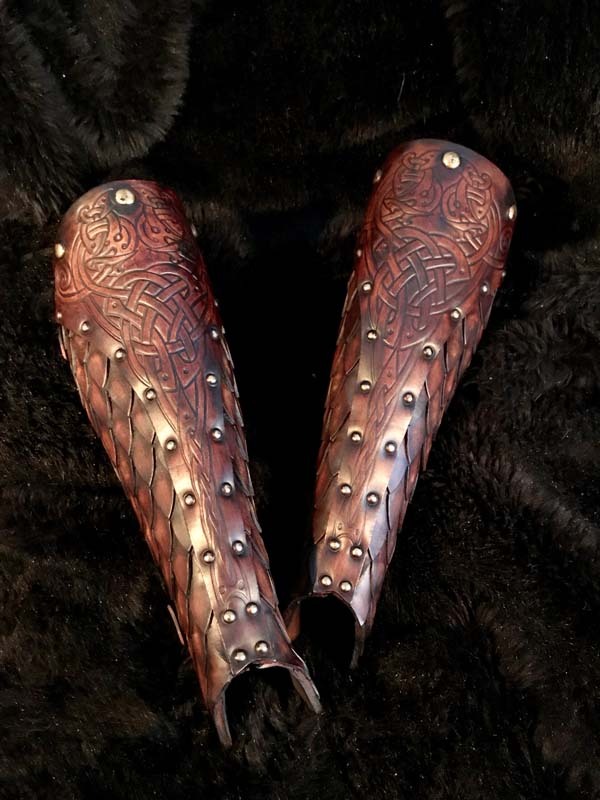 The accompanying Greaves and Vambraces complete this great looking set. The Greaves and Vambraces have been made of only the best premium grade top grain 3.2 and 2mm mm Veg Tanned leather, which has been cut, embossed, water formed and hardened, then hand dyed and finished with the Black Raven Armoury “aged battle worn” look. 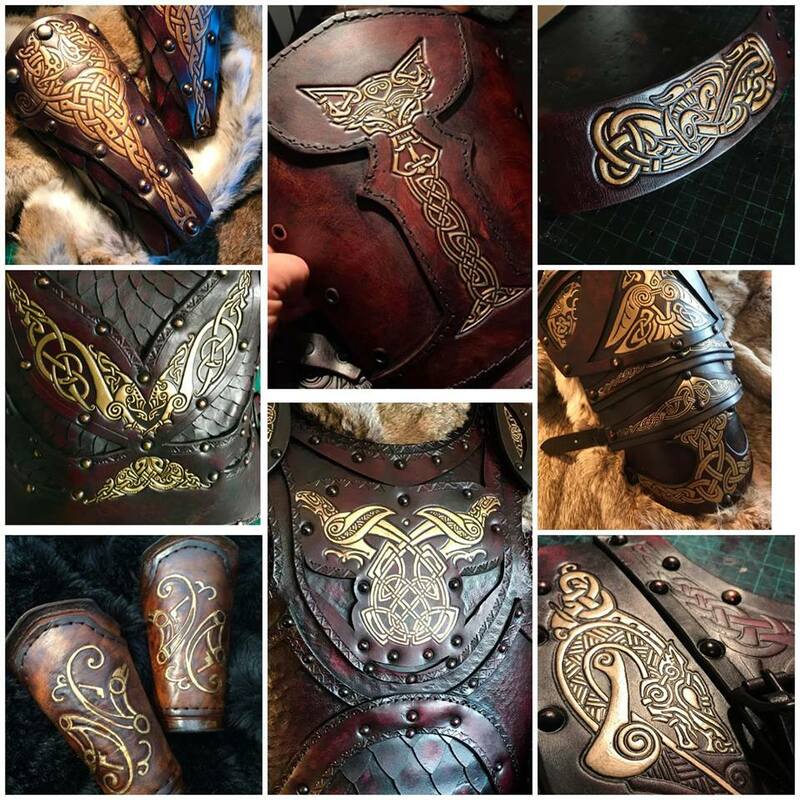 ?All armours come ready built and finished in the colour of your choice, apart from the undyed natural version which is left for you to stain and finish, in your own choice of colour. Designed by Alex Agricola the founder of Black Raven Armoury, with original Norse Art by our very own Vitor Gonzalez. The Sigrun leather armour is hand built by our expert armour smiths. So often we hear phrases like impractical, overtly sexual and uncomfortable when describing female armour. 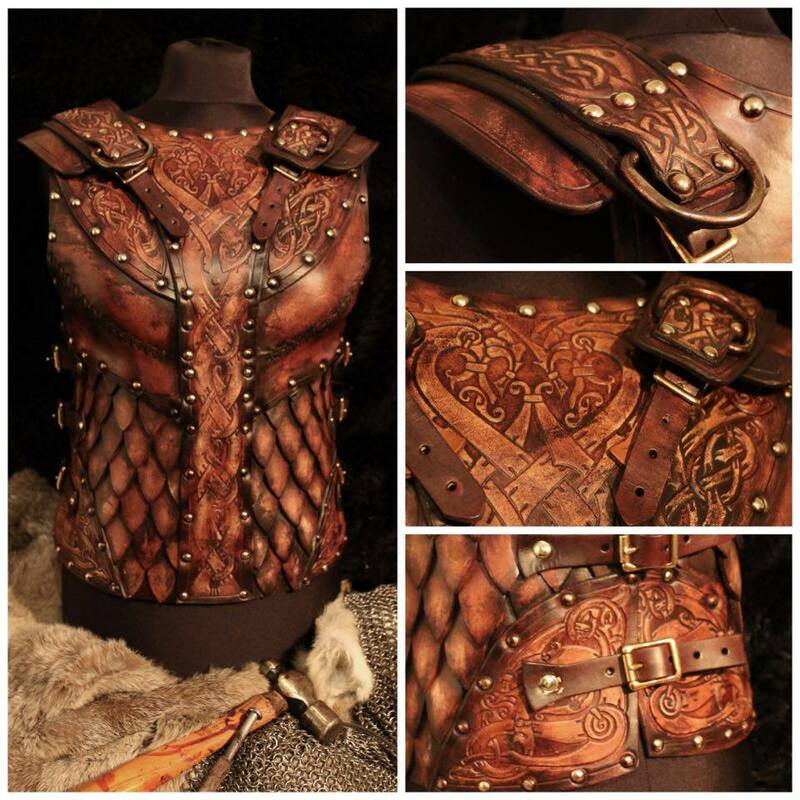 The Sigrun female armour is the perfect leather armour for women, a perfect joining of protection and elegance. The full Sigrun Armour comes complete with body (chest piece, breast-plate), greaves and vambraces (gauntlets) all with matching designs. The Sigrun, is a piece which combines beauty, presence and practicality. 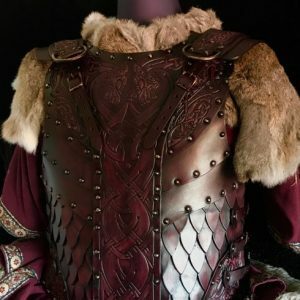 Kit that would work whether one wields a sword? or rules an Empire. A combination of formed breast sections that create a practical shape suitable for combat comfort. The Sigrun features over 100 individual front and rear scales. For mid section movement they’re all made using overlapping suede-backed 3.2mm veg. The feminine shape offers protection and grace and is adjustable at the sides, front & rear shoulders. 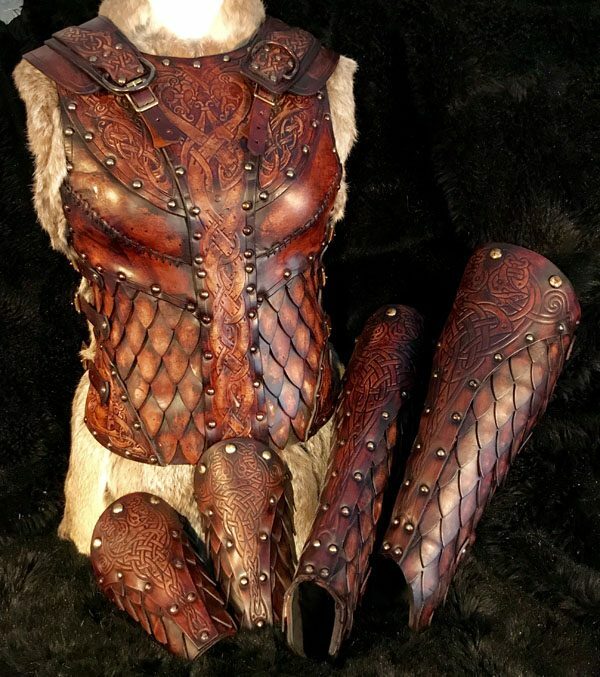 The Sigrun Leather Armour… because a lady deserves better than a chain-mail bikini. ?I fist saw her at court in Baron Heinrich von Lauffer’s estate. She wore the armour of a warrior queen. I’d never seen a lady so regal who wasn’t a queen… well, she wasn’t a queen then…? Size options vary from 36? bust up to a 54? bust and C cup to an F cup.